We at Trinity Chiropractic are proud to be a part of the Stittsville and Kanata community and we are very grateful for the praise we receive. Below are some kind words from our growing family of Trinity Chiropractic patients. Jane’s welcoming persona put me at ease immediately. Having never been to a chiro, I wasn’t sure what to expect and Dr. Jeff did a great job at explaining his approach. I feel that I am in good hands with these two! Jane and Dr. Jeff – you are both amazing! It’s fantastic having someone care to help fix my lower back pain which has been going on for years. Jeff is very knowledgeable and makes the appointment so comfortable and easy. He is really able to make you understand what the issue is, and then continue to fix the issue so everything is working properly while relieving the pain. 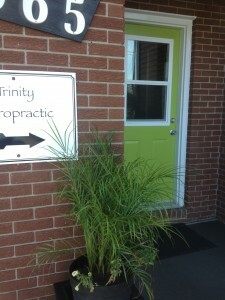 The staff at Trinity Chiropractic are very welcoming and helpful. I felt cared for the second I stepped into the office, and was quite surprised to see results after just one adjustment with Dr. Jeff. I would highly recommend Trinity Chiropractic to family, friends and colleagues. Very comfortable atmosphere, everyone is friendly and easy to talk to. Neck and back problems are explained clearly so it’s easy to understand the issues and how to resolve. I came to the right place, Trinity Chiropractic (Dr. Jeff) for my treatment. I suffered from pain and couldn’t sleep well from my neck and shoulder pain. Also, I couldn’t move my neck properly. In couple of weeks, I noticed a big improvement, feeling good, and less pain. I would recommend Dr. Jeff at Trinity Chiropractic. After suffering with back pain, daily headaches and migraines for so long, I am so appreciative a friend referred me to Trinity Chiropractic! I am feeling fabulous for the first time in years and thrilled to continue my path to great health. I have been spreading the word to everyone I know. Very friendly well run establishment. Jeff and staff are true professionals. I’m pleased with the level of service and friendliness. I will definitely refer others to this practice. Thanks very much for your attentiveness to my needs. I am so pleased that I feel better already and I believe it has only been 2-3 weeks. I feel like I am a valued partner with Trinity in my own health and wellness. We are clearly reading from the same script. Thanks very much. I have not seen a chiropractor before, I didn’t see the point. My confidence has been restored. After my work injury, I wasn’t sure I’d ever get back to normal. But by following Dr. Lowthian’s guidance and making recommended visits, I’m almost fully restored 6 weeks later. Thank you to him and Karen for there wonderful help. Dr. Jeff is the best chiropractor I have ever been to, by far. I have only had to use others due to an emergency or two and that showed me quickly how much better Dr. Jeff was in his care for clients. Dr. Jeff takes into consideration all aspects of your life and makes helpful suggestions, focusing on what is best for you as an individual. His knowledge and genuine concern and care for his patients is top quality and he and his staff are always friendly and cheerful. One of the only health care places I wish I had to spend more time at! As a weekend warrior, lover of high heels, owner of a large dog who pulls my arm off and olympic laptop user, it’s fair to say that I wouldn’t be able to do what I love without the help of a chiropractor. But I chose this chiropractor in particular. What differentiates Dr Lowthian is his combination of knowledge, empathy and very skilled hands. He knows his stuff inside out and applies it to your unique situation. His office is very well managed (I’m never waiting long) and has a warm, kind atmosphere. Come for a visit and leave happy & healthy every time. I had been experiencing migraine headaches on a weekly basis for six years, and had become very concerned about the amount of medication I was taking. These headaches where ruining my life. After only a few visits I began to notice an amazing difference. My headaches are almost gone now. My general health and outlook on life has greatly improved, probably because I’m not always in pain. I would recommend the chiropractic approach first before trying other treatments. I’ve thrown away the pills! I was in the middle of a 16-week training program to run a marathon when I had to stop due to an injury in my lower back and my right hip. I was at a real low point and unable to run more than a few hundred meters. Since beginning regular care, the back and hip pain has improved dramatically and quickly. After three months of treatments I was able to run well enough to run a marathon and qualify for the Boston Marathon! Having low back pain causes you to constantly manipulate how you manage your everyday life. The care I have received is amazing! The road to recovery is not quick, however once the gains begin it is amazing how much simpler life is without pain. I only wish I had seen Dr Lowthian as a preventative measure rather than seeing him when I had a full-blown problem. I was off work for 8 months because the pain was so intense. I could not sleep or just function on a daily basis. A specialist told me in the past that I would have to live with this, and that I would need to consider long-term disability. I am so pleased with my progress; I have not had any numbness in my legs or feet. I rarely experience the constant ache in my back. I am able now to sleep through the night and can move much easier in the morning! Contact us to schedule an appointment so we can help you and your family.